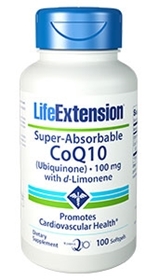 Life Extension's new Super Absorbable CoQ10 with d-Limonene is a super-emulsified formulation that significantly increases the amount of CoQ10 absorbed. Unlike other supplements that contain micronized CoQ10 particles, Super Absorbable CoQ10 with d-Limonene contains smaller, nano-sized CoQ10 particles that enhance this absorption. Research shows that people taking this formula have higher blood levels of CoQ10 than those taking other formulas. The patent-pending emulsifying system breaks down the fat-soluble CoQ10 particles into millons of microscopic droplets, allowing the body to absorb the CoQ10 much more effectively. Life Extension uses only naturally extracted, cold-pressed orange oil to yield d-Limonene, which has been shown in clinical studies to promote healthy cell division. The mitochondria are the cell’s energy powerhouses, and coenzyme Q10 is an essential component of healthy mitochondrial function. CoQ10 is required to convert fats and sugars into cellular energy, yet the natural production of CoQ10 declines precipitously with advancing age. When the body has an ample amount of CoQ10 the mitochondria can work most efficiently throughout the entire body, in cells everywhere, including the most densely populated area, the heart. When coenzyme Q10 is orally ingested, only a certain percentage is actually absorbed into the bloodstream. Findings in human subjects indicate that higher doses of CoQ10 provide significantly better effects than the doses that supplement users typically take. Since CoQ10 is such an expensive nutrient, an alternative to taking higher doses is to increase the amount of CoQ10 that is absorbed. Life Extension is pleased to announce the availability of an emulsified formulation that significantly increases the amount of CoQ10 absorbed into the bloodstream compared to previous versions. By delivering so much more CoQ10 into the blood, Super-Absorbable CoQ10 with d-Limonene drastically reduces the cost per milligram for consumers. By taking just one 100 milligram capsule per day of this formulation, people obtain the benefit of taking higher amounts of regular CoQ10 supplements. For those who want to take very high doses of CoQ10, a 200-milligram softgel capsule of the Super Absorbable CoQ10 with d-Limonene is available. By taking just two of these 200 milligram capsules per day, one would obtain CoQ10 blood levels equivalent to ingesting about 697 milligrams of conventional CoQ10 supplements. Based on an increasing volume of published scientific findings, it appears that higher intake of CoQ10 is desirable. The good news is that the patent-pending emulsification technology used in Super-Absorbable CoQ10 with d-Limonene has been shown to significantly increase blood levels of coenzyme Q10 compared to previous versions. This means that taking 100 mg of this emulsified CoQ10 supplement provides the body with what used to take a lot more coenzyme Q10 to achieve. For those seeking the benefits of higher doses, this product provides ultimate absorption for no more money than the previous CoQ10 version. Without adequate coenzyme Q10, the ability of cells to utilize energy substrates declines precipitously. The end result is the development of multiple disorders characteristic of normal aging. Coenzyme Q10 is incorporated into the mitochondria of cells throughout the body where it facilitates and regulates the transformation of fats and sugars into energy. A large body of scientific evidence shows that CoQ10’s ability to restore mitochondrial function has a profound effect on one’s overall health. As people age, their natural synthesis of CoQ10 slowly declines. When people take “statin” cholesterol lowering drugs, CoQ10 synthesis can be reduced even further. With the availability of this highly absorbable coenzyme Q10, it becomes much more affordable to supplement with greater doses. For those seeking the higher doses now being recommended by more scientists, one of the new emulsified 100 mg capsules would provide an efficient and economic method of increasing blood levels of coenzyme Q10. There is also 200-milligram strength of this new enhanced emulsified CoQ10 for those seeking maximum blood levels. Other ingredients: ethyl oleate NF, polysorbate 80, softgel (gelatin, water, glycerin), DL-alpha tocopherol, rosemary extract. This product contains NO milk, egg, fish, peanuts, crustacean shellfish (lobster, crab, shrimp), tree nuts, wheat, yeast, gluten, corn, or rice. Contains NO sugar, artificial sweeteners, flavors, colors, or preservatives. For those over age 30, take one softgel daily after a meal, or as recommended by a healthcare practitioner.